Tucked amid the Great Smoky Mountains in western North Carolina, the remote Fontana Village Resort offers not just relaxation and recreation, but also an up-close look at an unusual “company town”. 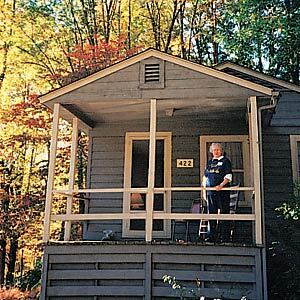 First known as Welch Cove and now privately owned, the village was created in the early 1940s to house 5,000 workers and their families during the construction of the huge Fontana Dam. It still features many original buildings, including worker's homes converted to rental cottages. My husband remembers attending the school, now a recreation hall and restaurant. Don't miss the popular soda fountain, a general store and a museum housed in an 1875 log cabin. Fontana Village is located on State Highway 28, about 7 miles east of U.S. Highway 129 and the North Carolina-Tennessee state line. The nearby campground at the base of the dam is open May through October. Tent sites are $15 per night; sites with partial hookups are $20. An inn, cottages and a houseboat are also available, with nightly rates ranging from $49 to $229, depending on the season and the kind of accommodation. For more information call 1-800-849-2258.